View More In Drug Tests. 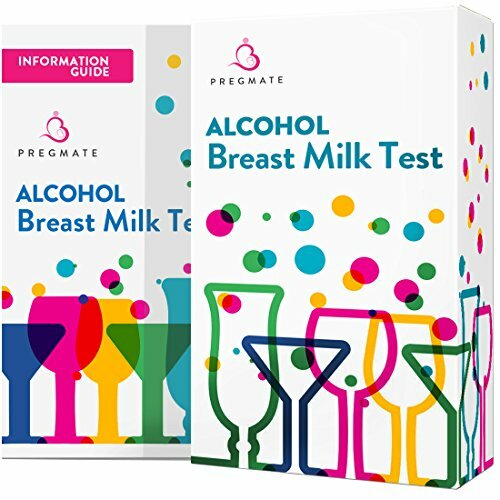 PREGMATE Alcohol Breast Milk Test detects the presence of alcohol at a level of 20 mg/dL or greater in breast milk. The test consists of plastic strip with a reactive test pad attached to the tip. The test pad will change color on contact with breast milk that contains alcohol. Express milk directly onto test pad OR dip test pad in small portion of milk from a pumped sample collected in a clean, dry container. Remove test strip after 3 seconds. 2. Tap excess breast milk off test pad. 3. Wait exactly 2 minutes. 4. Read test results by comparing test pad to the Color Card. Positive:The test will produce a color change in the presence of alcohol in breast milk. The results will show the concentration of alcohol in milk in a scale from 0.02% to 0.30%. This is represented by the intensity of the blue color which ranges from light blue (0.02%) to dark blue (0.30%). Please, use the provided scale for more detailed reference. The test may produce colors that appear to be between adjacent color examples. Negative:When the test shows no color change this should be interpreted as a negative result indicating that alcohol has not been detected. Alcohol passes freely into mother's milk and has been found to peak about 30 to 60 minutes after consumption, 60 to 90 minutes when taken with food. It takes a 120 pound woman about 2 to 3 hours to eliminate from her body the alcohol from one serving of beer or wine. The more drinks you have, the longer it takes for the alcohol to clear your system. If you have any questions about this product by PREGMATE, contact us by completing and submitting the form below. If you are looking for a specif part number, please include it with your message.